I'm trying to pulse automate it based on heat. Say I don't want lava in my reactor chamber so stop heat is something like 8k heat and restart heat is <= 2k heat. Timer is deactivated (5E6 seconds). Now From my understanding, the condensator will only be refilled once it's down to 15% "health". 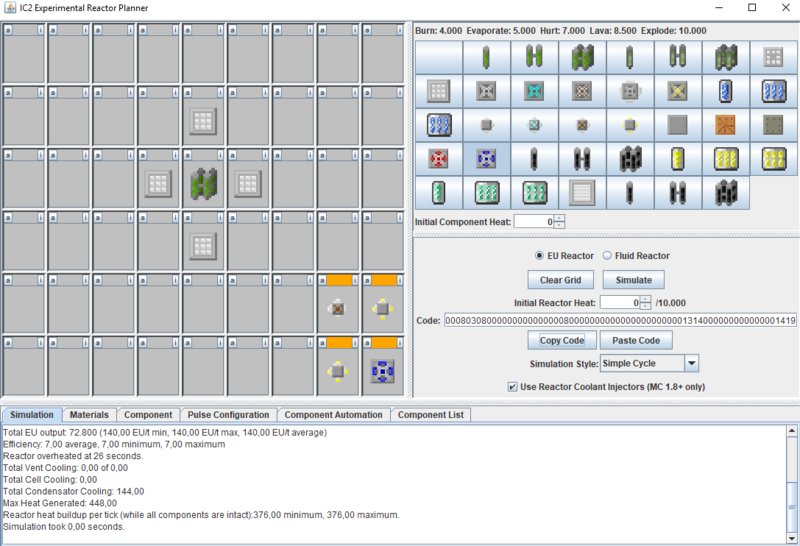 But the heat exchangers try to keep everything at the same health level, so the condensator will never go below 15% health because that would mean that the reactor hull is below 15% health, which would mean lava, which is not possible because of the automated shutdown. Heat shields and vents don't solve the problem in my mind, because they don't get the condensator to recharge either (and don't dissipate nearly enough heat to be useful for me). Did I miss anything? Or is the only solution really to flood my reactor chamber to prevent lava? I'm also very confused about heat. In the wiki and in the simulator as well, both Heat/tick and Heat/seconds are used. And not in a consistent way, i.e. things don't work out. So just to get some verification. heat is always added to the hull on a per tick basis but cells generate heat on a per second basis?? does a reactor heat vent move 72 heat per second or per tick?